Imagine spending three months reading only the books you really want to read. The TBR Double Dog Dare is back again to help make this dream a reality. Starting at 12:00 a.m. on January 1, 2015 you can begin reading only the books you want to read, the books you’ve had on your shelves for years now, waiting for that happy day when you would finally get the long-awaited chance to read them. That day will soon be here. Forget about keeping up with ARC’s, reading the latest nominees for whatever award they’re giving away this month. Never mind the best seller lists or the tiresome memoir your book club has forced on you. Who cares what Michiko Kakutani is reading, anyway?Put the assignments and the reading lists aside and read something fun, something wonderful, something covered in dust. From January 1 to April 1 read nothing but the books you want to read, the books you already own. Anyone can join. 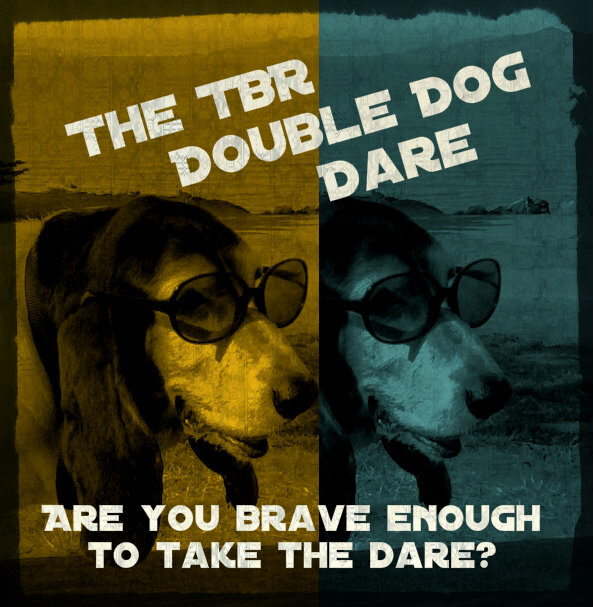 Complete details are posting on the TBR Double Dog Dare page. Just leave a comment to sign up. Join Dakota, me and all the cool kids and take the TBR Double Dog Dare! Ahhh! I think I can do it this year! I have 313 TBR books and I have stopped buying and for some reason I am not winning giveaways much. And so far I haven’t any requests for reviews. I just have two reviews due and then I will be free, Will see if I can cut that down to 300 by New Year’s Day. Will try it. I have seen your Double Dog Dare for several years but this time will plunge in!!!!! I am in! I like the badge for this year 🙂 I will be putting my post up over the holiday. Thanks again for hosting us again! I am in – this will be my third year doing it! My only exceptions will be books I put on hold in 2014 and books I am required to read for school. I have just signed up for a similar challenge. 20 TBR minimum for 2015. Tired of reading everything except what I own so going to read my stuff also next year. Happy reading. I want to, so I will! I’m currently New York waiting for the parade to start. But I’ll add you all to the list once I’m back in California. Next Next post: Sunday Salon: Thanksgiving in New York City!